Fortis is of course closely associated with the Russian Space Agency through their Official Cosmonautis Series. And finally, Fortis has designed a ceramic bezel that is truly the standout feature of this new watch. The Fortis Classic Cosmonauts Chronograph Ceramic AM on bracelet features a 42 mm case with complete chronograph functions. The dial is silver (hence the AM in the name of this watch), with the hour and minutes hands trimmed in black with applied green SuperLuminova and an orange seconds hand. 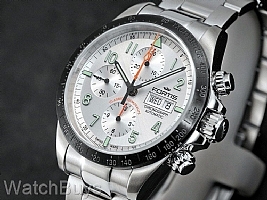 The Fortis Classic Cosmonauts Chronograph Ceramic AM is a great watch at a reasonable price. The white dial is amazing in it's detail, I often find my self distracted by it throughout the day! The finishing of the case, bezel, bracelet is also what it should be for a watch at this price point. I would have preferred the bracelet/case to be entirely brushed instead of partly brushed/partly polished, but I knew that when before hand. If there's anything to complain about, it's the case back. The bulging shape of it makes the watch less comfortable than it should be. Perhaps it's just my wrist, but it adds pressure to my wrist that occasionally causes me to readjust it's position. A small annoyance.